We probably won't hear about the Week 4 home game against Arizona State until after the Oklahoma State game. If we win in Stillwater, our ASU match-up might make the CBS slot at 3:30 pm. If we lose, it should be a later game on ESPN2 or ESPNU. 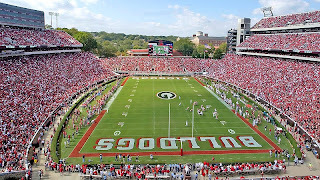 *A CBS executive said publicly a few months ago that the next 15 UGA vs. UF games would air at 3:30. They just haven't confirmed this particular season's game. I hate that our guys will drag into Athens about dawn Sunday morning (assuming they don't stay overnight and fly out Sunday). Maybe starting so late will afford the team time to visit the William Jefferson Clinton Presidential Library and Massage Parlor. Off topic, but what's the deal on the Marlon Brown/Facebook rumoring? What's going on with Marlon Brown? Just a really low, vicious prank being pulled by someone who is likely a UT fan. Hello bourbon, it's me AwesomeDawg! Sweet. I'll be at the 3:30 Florida/Tennessee game. I was afraid it might be a 6:00 start and I'd have to worry about leaving early or missing kickoff of our game. Maybe let the "blackouts" rest. It did not work so well last time. It's a bullsh*t hoax. Dasher at UGASports.com confirmed it. EDSBS.com has the link to Dasher's comment about it.